The opening sequence of this Ken Maynard Western is spectacular: Attempting to save heroine Beth Marion from the ubiquitous runaway horse, the hero makes a death-defying, head-first plunge on horseback into the Kern River far below. The stunt was performed by Maynard's unfairly neglected double, Cliff Lyons, who would marry Marion two years later. 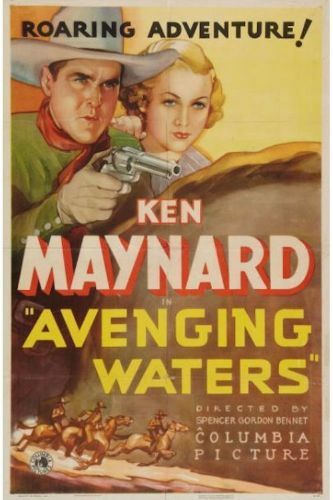 As for Maynard himself, the veteran cowboy star didn't do much action-wise in Avenging Waters, spending instead an inordinate amount of time playing his mouth organ and making romantic chit-chat with Marion. The story is the old one about the fencing off of the once free range. Ken and his top hand, Slivers (Wally Wales, aka Hal Taliaferro), are delivering a herd of cattle to rancher Charles Mortimer (John Elliott) when they have a run-in with Marve Slater (Ward Bond). The latter is demanding that Mortimer remove his new fences or else. The "or else" proves to be damming up the river and leaving Mortimer without water for his cattle. Ken takes umbrage to this kind of vigilantism but is overpowered by Slater's henchmen, Hoppy (Tom London) and Jake (Glenn Strange). A rain storm causes the dam to burst and the waters rush toward the shack where Ken is held prisoner. He is saved in the nick of time by his clever palomino, Tarzan, while Slater is left to drown in his own flood. Maynard's legendary ornery temper caused all kinds of delays on this inexpensive Western and the veteran star was getting a bit paunchy to boot. Director Spencer Gordon Bennet was forced to use rear-projection in a scene where Maynard desperately attempts to grab hold of Tarzan, one of the very few instances that this technique was used in a B-Western. The grand finale, the flooding of the valley, was done using a model built to scale and is not bad for this kind of low-budget fare.